Kobe Bryant gets a new toy to add to his already nice stable of cars. He just purchased a 2012 Ferrari 458 Italia for $329,000 and paid cash. Even though Kobe Bryant is going through a divorce with his wife Vanessa, life appears to be good for the Los Angeles Lakers shooting guard. As reported by AutoFixx, Bryant just purchased a 2012 Ferrari 458 Italia for $329,000 and paid cash. With the top salary in the NBA, at $25,244,000, even if he does have to give up half his fortune in the divorce, the price he paid for his new Ferrari is just chump change for the five-time NBA champion. It should make a nice addition to his already fine stable of automobiles. It’s not been determined if he has to spit his cars with Vanessa, but the 33-year-old’s garage already houses some super-fine automotive machines such as a Range Rover, Ferrari F430, Bentley Continental GT coupe, Azure Mulliner convertible, Cadillac Escalade and a 1963 Chevy Impala rag-top. AutoFixx reports the "Black Mamba" paid $100,000 more than the MSRP sticker price of the Italian supercar. If speculation is correct that he had to customize the roadster to accommodate his 6'6" NBA frame, then that’s a very expensive customizing job. I hope he also upgraded the 458 Italia with other goodies to make his ride stand out from any other Ferrari. Bryant’s 2012 Ferrari 458 Italia is powered by a 4.5-liter V-8 that sends 562 hp and 398 pound-feet of torque to the rear wheels through a seven-speed, dual-clutch automated manual transmission. Ferrari says it will go from a standstill to 60 mph in 3.4 seconds, which makes it one of the quickest cars on the planet. Not that anyone cares, but the Italia gets an EPA-estimated 12 mpg city/18 mpg highway. Ferrari actually offers some leading edge technology to reduce fuel consumption and increase performance. The optional HELE system includes an engine stop/start system, an efficient air-conditioning compressor, changes to the electrical system, and adaptive transmission programming and throttle response. It’s reported that Bryant takes a helicopter to most home games at the Staples Center, and doesn’t have to make the commute to work through rush hour traffic. So you have to wonder why he needs all these cars? 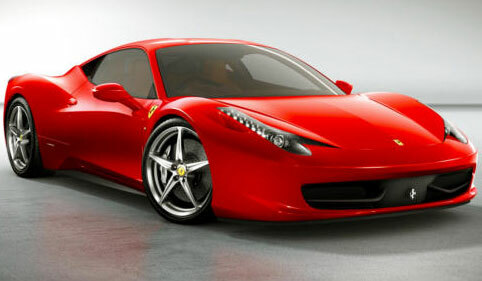 Regardless, the 2012 Ferrari 458 Italia should make a nice addition to Bryant’s stable of cars. We just have to wonder if the Black Mamba will get to keep all of them.